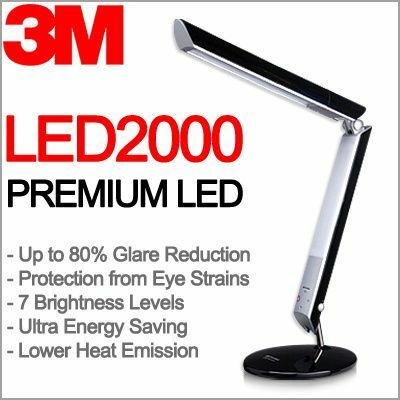 Prevent Myopia with 3M Polarizing Light! By the time our children complete their primary school education, more than half of them would require glasses. There is absolutely no cure for myopia and the best way to go around it is to prevent it. The good news is that myopia can be prevented with a as simple as ensuring good reading light. The need to reduce glare while reading or using the computer brings light (literally!) to an innovation called the Polarizing Light Technology by 3M. What we like about the BL5100 particularly is its steadiness on the table. We discovered that it was because of its anti-slip pad right below the base of the table lamp. It was easy to set up out of the box and we could easily adjust the tilt up to 90 degrees. We believe that the BL5100 is ideal for young children as it does not easily topple over. Even us parents need to make sure our reading light is bright enough and less straining on our eyes. Most of us who already have short-sightedness need to ensure that it does not get worse. For the environmentally conscious ones, this lamp also saves up to 80% of energy and absorbs harmful UV rays. The BL5100 3M Polarizing Light is a reasonable investment that can be used by everyone in the family. Use it when coaching your child in school work, when burning the midnight oil to finish up work or when doing some late night reading before bedtime. Ensure that there is sufficient ambient light in the room. If using the computer, adjust its screen brightness close to the brightness of the surrounding light in the room. Invest in a lamp which provides ample lighting yet reduces glare and strain on your eyes. The head of your table lamp should be above your line of vision. When using the table lamp at night, ensure that your room’s lighting is turned on too. This reduces the contrast in lighting that may otherwise strain your eyes. Spend less time of activities that require you to focus on small details. Rest your eyes every 30-40 minutes. Maintain a distance of 30-40cm away from your reading material. The 3M Polarizing Light BL5100 is conveniently available at major retailers including Best Denki, HomeFix, DIY and POPULAR Bookstores at $189. Previous articleCan Singaporeans live without maids? Next articleCan Emotional Intelligence Be Learnt?